Question: I want to monitor TCP connection dynamics (e.g., three-way handshake for connection establishment, and four-way handshake for connection tear-down). 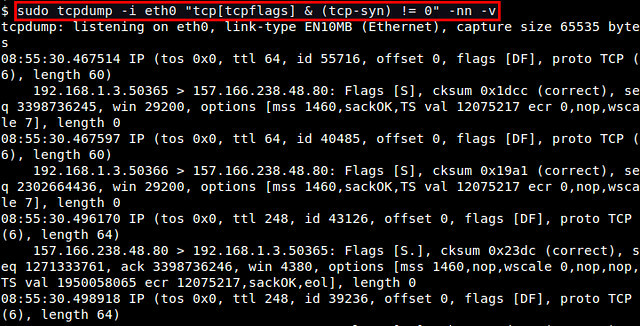 For that, I need to capture only TCP control packets such as those with SYN, ACK or FIN flag set. How can I use tcpdump to capture TCP SYN, ACK, and/or FYN packets only? As a de-facto packet capture tool, tcpdump provides powerful and flexible packet filtering capabilities. The libpcap packet capture engine which tcpdump is based upon supports standard packet filtering rules such as 5-tuple packet header based filtering (i.e., based on source/destination IP addresses/ports and IP protocol type). "proto" can be one of well-known protocols (e.g., ip, arp, tcp, udp, icmp, ipv6). "expr" represents byte offset relative to the beginning of a specified protocol header. There exist well-known byte offsets such as tcpflags, or value constants such as tcp-syn, tcp-ack or tcp-fin. "size" is optional, indicating the number of bytes to check starting from the byte offset. Using this format, you can filter TCP SYN, ACK or FIN packets as follows. # tcpdump -i <interface> "tcp[tcpflags] & (tcp-ack) != 0"
# tcpdump -i <interface> "tcp[tcpflags] & (tcp-fin) != 0"
# tcpdump -r <interface> "tcp[tcpflags] & (tcp-syn|tcp-ack) != 0"
and if you want to have fun with intruder SYN and ACK, try the LaBrea sticky tarpit.